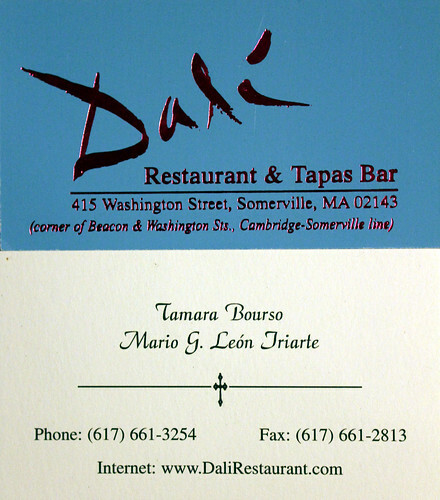 I had visited Dali in Somerville once before at the recommendation of a Spanish/French friend who is now back and France and thought Mr Z would also benefit from her suggestions too. Unfortunately like so many great places in Boston this place does not take reservations so we put our name down for the hour long wait. Never fear as the gentleman at the front quickly found a seat for me and all the señoritas that were waiting. Señores however had to stand...sorry lads. We ordered sangria and breathed in the ambiance of wine and spices from the tapas been served around us. The full menu is available at the bar and we drooled over the other patron's food while pouring over the menu and revising our list of what to order for the night. 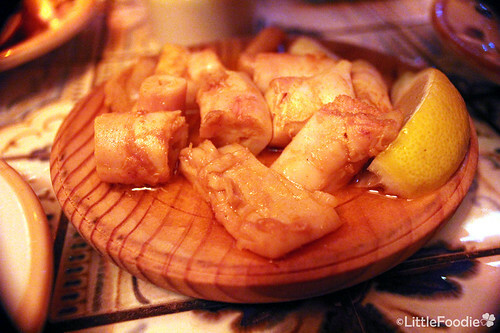 As soon as we were seated we started with the seasonal special of Pulpo A'Feira or sauteed octopus with paprika. This is spiced octopus with a splash of lemon sour and perfect to open the palate. 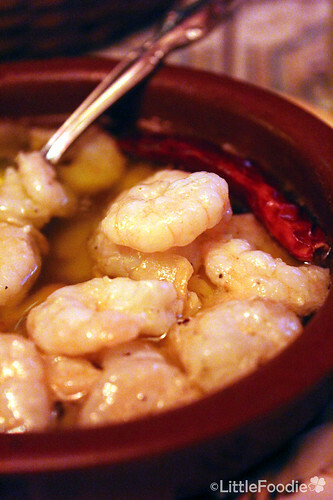 We then dug into gambas al ajillo (garlic shrimp) which comes sizzling in garlic oil and with just the right amount of spice and dash of vinegar. Despite potential health detriments I couldn't help consuming some garlic oil soaked bread after we were done with the shrimps. 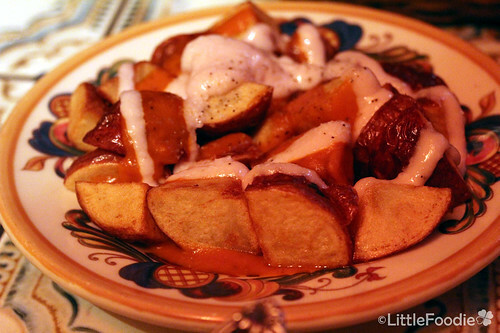 Patatas bravas is one of my favourite tapa staples and I highly recommend the ones at Dali. Slightly crispy, bite-sized chunks of potatoes covered in paprika and all manners of spices with aioli sauce. What's not to love. 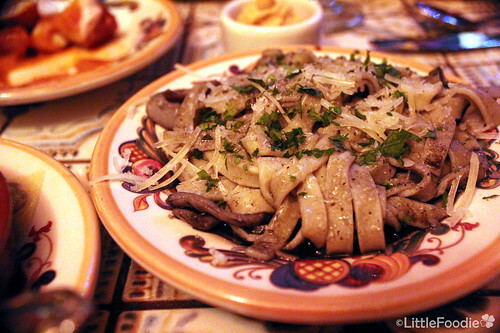 Another seasonal specials was the pasta con chipirones - squid ink pasta. This dish is my choice of pasta which has unfortunately fallen out of favour amongst to the general public due to the after effect of looking like an Adam's family extra. Nevertheless Dali does an exquisite take of this dish topped with shredded manchego and with no shortage of black squid ink. Finally for dessert we had the classic churros with warm chocolate sauce. 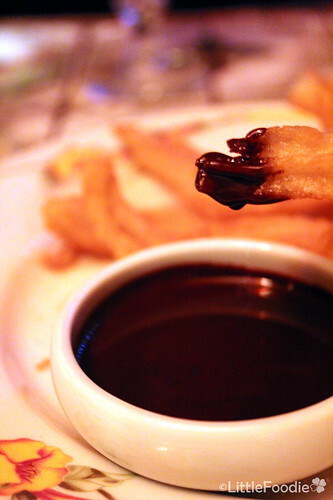 I admit not the best churros (a bit over fried) but the chocolate sauce was not too sweat giving it a great finish. The place was packed and it seems to be a hot spot for birthday celebrations. The staff help create a great atmosphere and if you are lucky you might even catch them perform some amateur Spanish dances. As mentioned we had a long wait. But please don't let this put you off. Apart from been able to enjoy the sangria, there are two little stores on the other sides of the street from Dali that helped pass the time. The Wine and Cheese Cask has a great selection of local and international wine and cheese. However like most fromageries in Boston there was only a small selection of Aussie cheese. Not that Australia is particularly well known for our cheeses but I'm craving some good King Island Double Brie or Yea black waxed vintage club cheddar. On the plus side the wine and cheese store is complemented by The Biscuit which is a little local bakery with great freshly baked bread and pastry. Food: Little plates of delightful tapas. Must try: Patatas bravas, Gambas al Ajillo. Setting: Decorative Spanish accents accompanied by an exciting vibe in celebration of food. Service: Despite the initial long wait to get a seat the service at the bar and the table was fast and attentive.